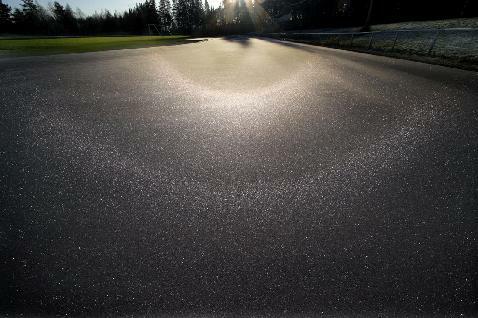 The diamond dust that developed on the night of 5/6 November stayed until next midday. Here are two photos of what was seen in the daytime. The diffuse arcs were at times quite strong, showing up against buildings some 100 meters distant. But I did not manage to get a photo when they were at their best. This view shows several "rare white arcs". On the right the long spectral arc is 46 supra/infralateral arc. Towards the middle of the image from top to bottom are helic, subhelic and Wegener arcs. Diffuse and Tricker anthelic arcs are seen on the left and also weakly a patch of subanthelic arc. On parhelic circle blue spot is in the center of the photo. 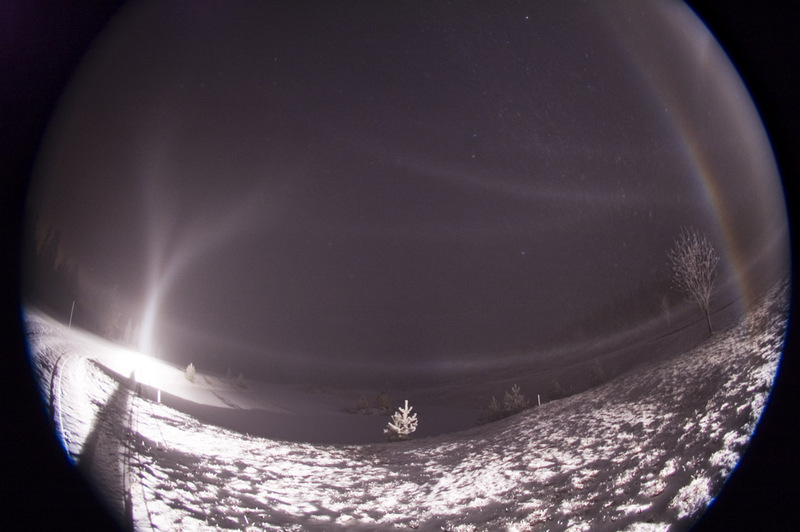 On a couple of days there have been ground halos in Juva. It was best seen on a sportsfield running track. I stacked 45 images in Photoshop. Photographed with 10-mm and cropsensor. Having kept a keen eye on the weather for quite a while Marko Mikkilä and I finally managed to spent a few days (or, rather, nights) in Rovaniemi shooting halos. We observed several interesting displays the best of which featured subhorizon Lowitz arcs. Similarly, subhorizon parhelic circle was captured by placing the light source to a negative elevation. 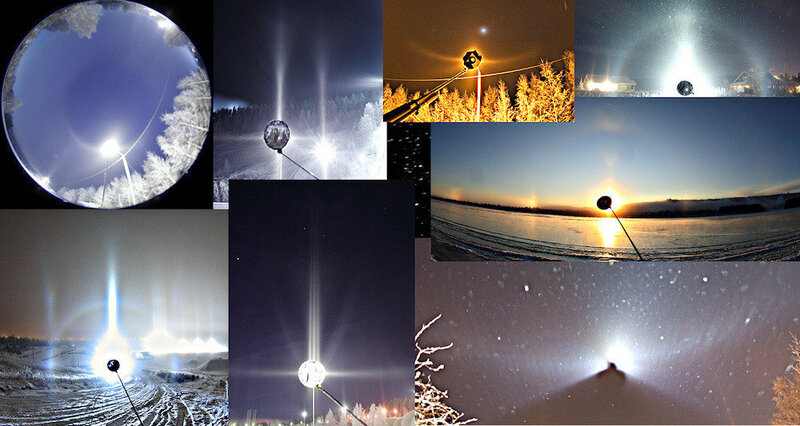 We observed superparhelia and several other divergent light halo forms such as CHA and 120 degree parhelia. Both of us got to see several personal firsts so we consider the mini expedition a success. Amidst all the frenzy, we shot videos (1) inside the crystal swarm. Mikkilä's custom modified HID lamp proved extremely bright and useful in these conditions. We were able to illuminate objects several kilometers away with it. 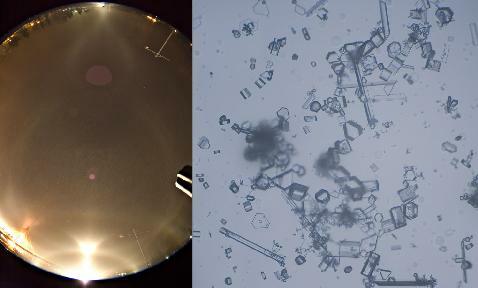 We also sampled crystals during a Moilanen arc display (2). The photos displayed (by Mikkilä & Luomanen) were captured between 15 and 17 November 2008. Last friday I was on a first aid course in Köngäs and noticed on the snow surface a suspicious looking 22° degree halo. The lack of sharp inner edge reminded me of last winters snow surface odd radius displays. So on a lunch break I went to a lake ice to photograph. There was only time for 79 shots, but that was enough to make 9° and also faint 24° halo appear. Given is also a mirrored version of the stack. 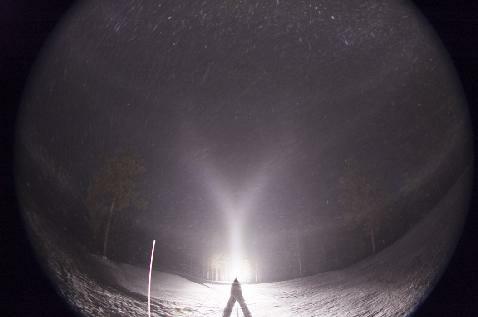 Last night at the Ylläs ski resort a diamond dust developed. Here is one photo showing the display at about 14 degrees of negative lamp elevation. There seem to be no halos from column crystals. The sparse crystals on the Petri dish show relative abundance of triangles. Possibly this is because I was close to the snow guns, further away most of the crystals may grow out of triangular shape. Yet another photo of the 5/6 November night in Rovaniemi shows blue spot on the right. The diamond dust was often quite thick with no stars visible above, and in the lamp light it felt like being inside a crystal storm. This is a single photo with some 30s exposure. One of the advantages of bright spotlight is that you need not to go through the trouble of getting in Ilyushin IL-76 to have a good view of halos below horizon. 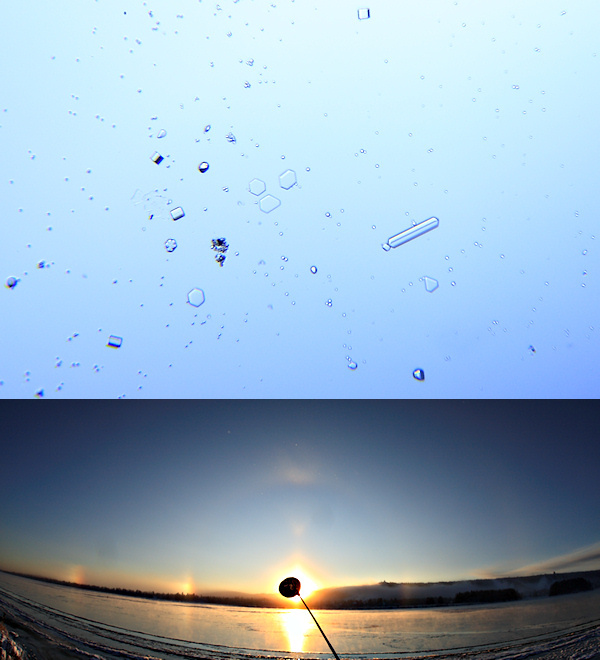 In diamond dust, just place the light below the horizon and above the horizon you will have a below horizon halo view. As in the photo here. Here is one stage of a display on the night of 5/6 November in Rovaniemi. The sharp intensity gradient at the zenith marks the outer edge of sun pillar, that has been formed from triangular columns - if parallel light simulations are to be believed. Here is another display from the first diamond dust night Rovaniemi. The crystals were rather small as I was close to the snow guns. There was also Moilanen arc, but in the photo it is overexposed. The weather in Vecsés, Hungary was mostly grey on 12 November, therefore the display came rather unexpected. Low in the horizon, covering the place of the parhelia and most of the 22° halo there was a thick cloud which remained there during the entire display. First the bright upper tangent arc appeared, but as the high clouds were moving, soon the upper sunvex Parry arc formed the second "V" in the sky ( 1 – 2 ). It was of the same intensity as the UTA, and I did not have to wait long until I could catch sight of the suncave Parry arc, as well ( 3 ). Unfortunately, Tape-arcs cannot be confirmed from the images. 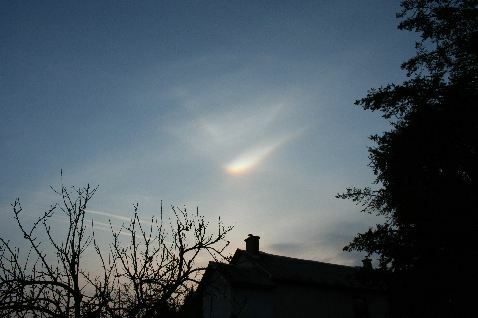 When the Sun was of 4.1°-4.5° elevation, besides the supralateral arc, another halo patch formed under the CZA ( 4 – 5 ). 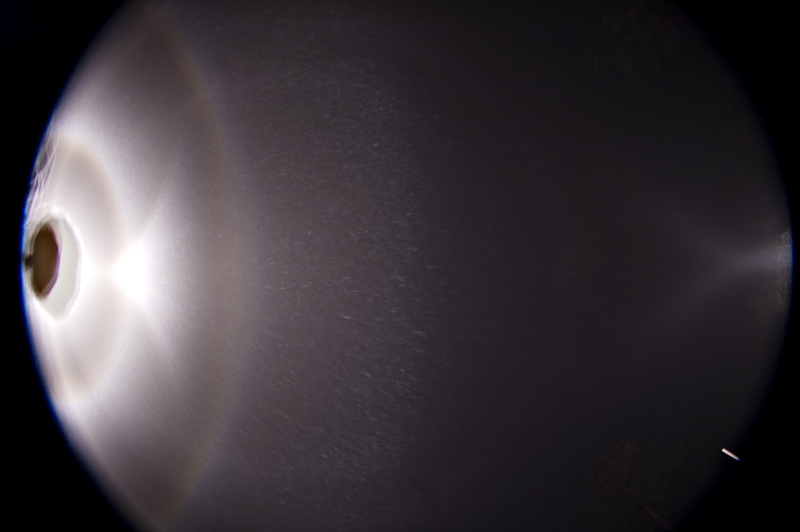 I automatically took it as part of a 46° halo, but later it turned out that it might as well be 46° contact arc. 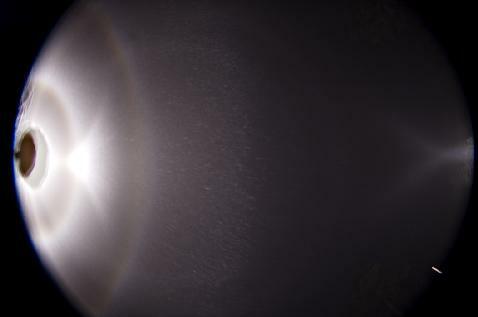 As contact arcs are formed by Lowitz-oriented crystals, I had a closer look at the top of the 22° halo (what was outside the thick cloud), and unsharp masking of photos revealed lines that may be Lowitz arcs – if not jpg artefacts. It must be noted that all these images were taken about 5-7 minutes before the halo patch appeared. ( 6 - 7 ). The diamond dust season began in Rovaniemi on the night of 1/2 November with three snow guns running in the ski jump. Here is one of the displays photographed that night. It is noteworthy that the crystals have cavities in their ends and yet the halos requiring basal faces are strong.